A new friend from New York reminded me of the Cash bio I read a few years back. Like everyone, I loved “Walk the Line,” the bio-pic of the life and love of Johnny Cash and his wife June Carter Cash that came out years ago. It is not a true biography, really. 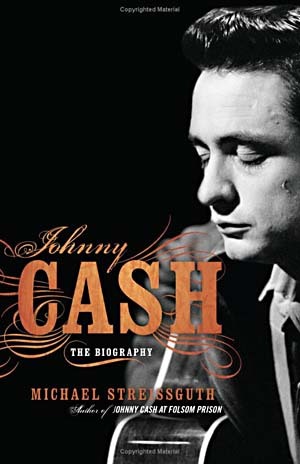 Robert Streissguth’s JOHNNY CASH: THE BIOGRAPHY is where you get more than the Reader’s Digest Condensed Version. Johnny’s story was, of course, about a many coming out of hard times, his well-known descent into drugs and alcohol that ruined his first marriage and nearly destroyed his career in mid-stream. The movie ends at the point where he turned his life around, married June, and got his act together again in the late sixties. It was not “happily ever after,” but for a movie that’s okay. Johnny was (and still is—he stays on my IPOD) one of my musical heroes in the late sixties, along with Bob Dylan, Willie, James Taylor, Neil Young and a lot of groups you haven’t heard of. It is also about how the love of a woman saved his life at its worst moment. He struggled with the poverty of his childhood and of early loss in his life. He carried a lot of that pain into his adult life and it nearly killed him. But he rose from the ashes of those shadows. A part of his journey was returning to the Christian faith of his childhood. Johnny Cash was earthy and blunt, but he was also unabashed about his love for Jesus Christ. Listen to those last words again: knowing that you’re not shut out forever, and that there’s a goal you still can reach. Not a bad word for now or anytime. Our mistakes are not the final word as long as we’re breathing. If you’re dwelling in the past—the songs you used to write, the band you once had, or the retirement nest egg you watched dwindle away, hey, it’s time to box up and change addresses to now. Posted on December 11, 2011, in Art, Christianity, Country Music, Jesus, Music, Spirituality, Theology and Life and tagged biography, country music, Folsom Prison Blues, hope, I Walk the Line, Johnny Cash, Music, Robert Streissguth, songwriter. Bookmark the permalink. 4 Comments. Thanks for your inspiration this morning. Oh, to be 5 again and have the world in the palm of your hand. I used to entertain my family singing Dolly Parton songs at that age. YouTube, if only we had you instead of Super 8, we’d all have immortality! Did you do “Jolene” Dolly was and is quite a wonderful songwriter, something many don’t know. It was Tom Waits, quoting that giant Johnny Cash, who reminded me when I really needed it that “life is a path lit only by the light of those I’ve loved”. My boy Frankie, who’s five, loves “Folsom Prison Blues” (which he calls “That Lonesome Train Song”), and “Long Black Veil” since he figured out a ghost sings it. Another great one here, Gary! Thanks Mike, and for inspiring me to go back and look at this again. Five year olds are pretty special. Mystical, they are.